After having the kit for Pansy Park for 10 years +, I finally got around to it, only to find that I was a yard short of the fence fabric. I googled it and started clicking on images. Lo and behold, one of them had a shop listed and I was able to get what I need from Switzerland! So never give up! Wow, you really did go the “extra mile” to get what you need. Good job! My daughter is a librarian. 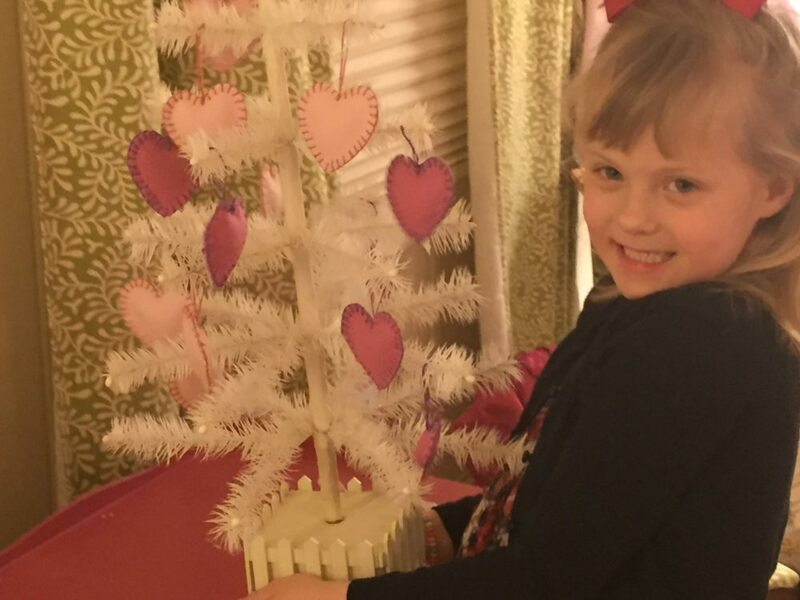 I asked her if she would like a white feather tree to decorate for the library. She very much likes the idea. 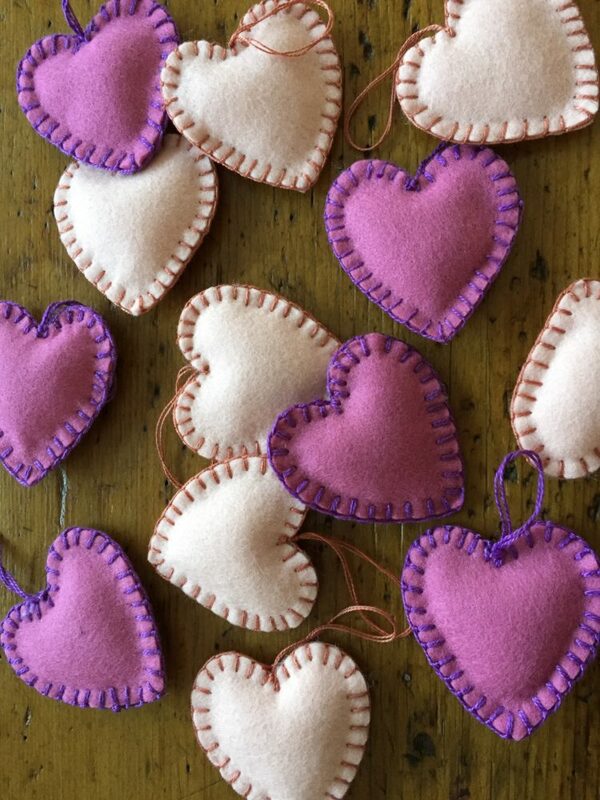 I plan to make the valentine felt hearts like you made. I am looking forward to any ideas you may have for Easter for the tree. Thank you for the inspiration. I guess I should get started. The Easter ornaments might take a little longer. 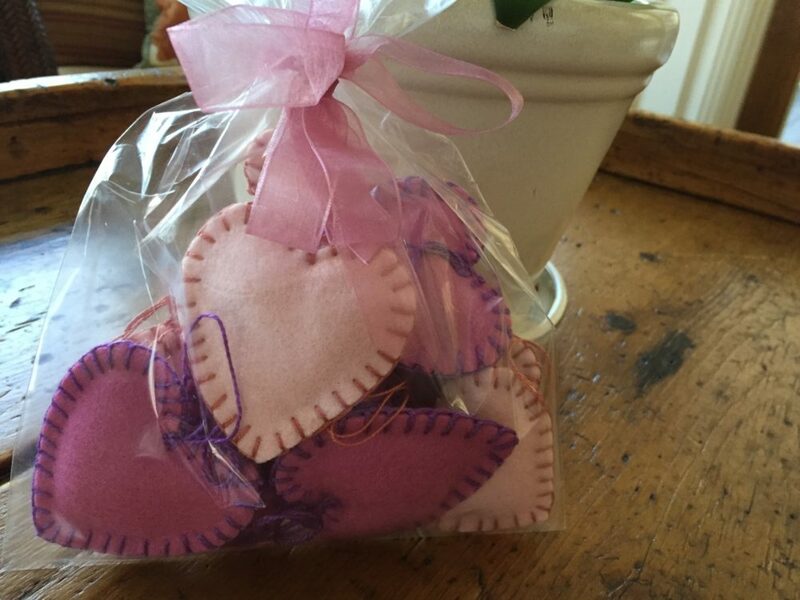 I am thinking of egg shapes decorated with a variety of stitches in the likeness of crazy quilt blocks. Love the Little Tree with the Hearts! You are so right, she will grow up faster than you can ever realize. Enjoy the years you have . Your grandchildren are beautiful and I’m so happy that you get to spend so much time around them. They grow too quickly as we all know. The quilts are beautiful and I can see from their work that they both are artistic. I love all the colors and the way you pieced everything together. I much say these are perhaps two of my most favorite quilts I’ve seen! 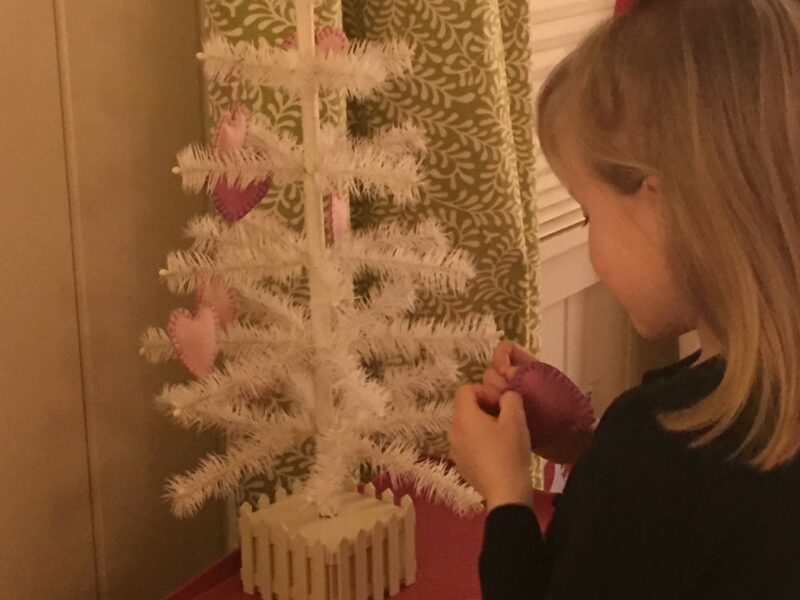 What perfect decorations for Ella’s feather tree, perfectly simple and just the right thing for Valentine’s Day. Can’t wait to see what you will think up for the next holiday!! Hi Lynette, Taylor & Ella are beautiful! You are creating cherished memories that each will hold in their hearts forever. Carrying on teaditions from your grandmother! Well, I sure do have fun with them. Just last night we made huge butterflies. Taylor made one that looked like the map of the world. Ella’s, of course, had hearts on the wings. 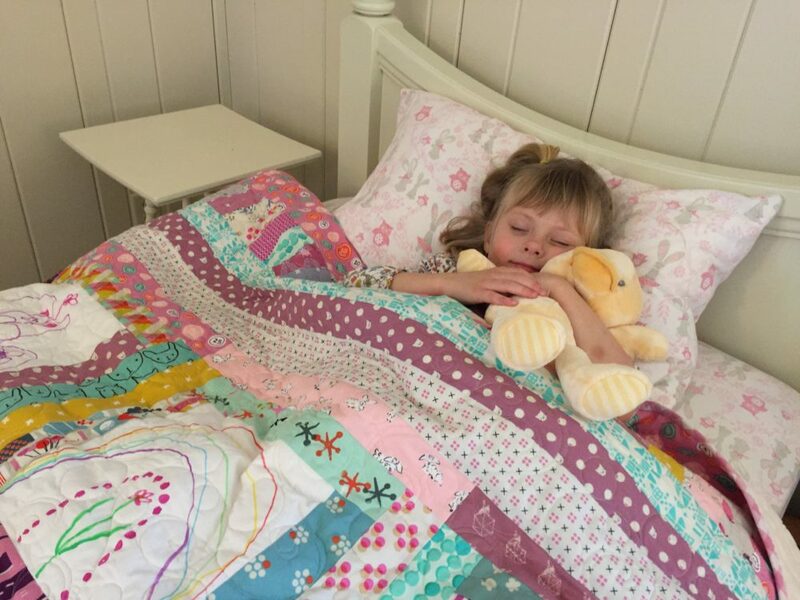 When they were done we pinned them on a quilt hanging on the wall in their playroom. Yay…I have found another use for quilts…colorful, decorative bulletin boards. Those grandchildren are indeed lucky. I also think Ella has the wonderful creativeness of her grandmother. She will always enjoy doing things with you! I sure hope we can continue all these fun, creative activities. It is fun to have another little audience for all the “ditzy” things I do. What a wonderful idea and she will cherish the time she spends with you. Welcome to my blog. Check out the archives listed on the right of the blog page. I described how to color the blocks in the two August posts…check them out for a quick tutorial on how to do the blocks. Piecing the quilts was a free-for-all with mostly 2″ strips. 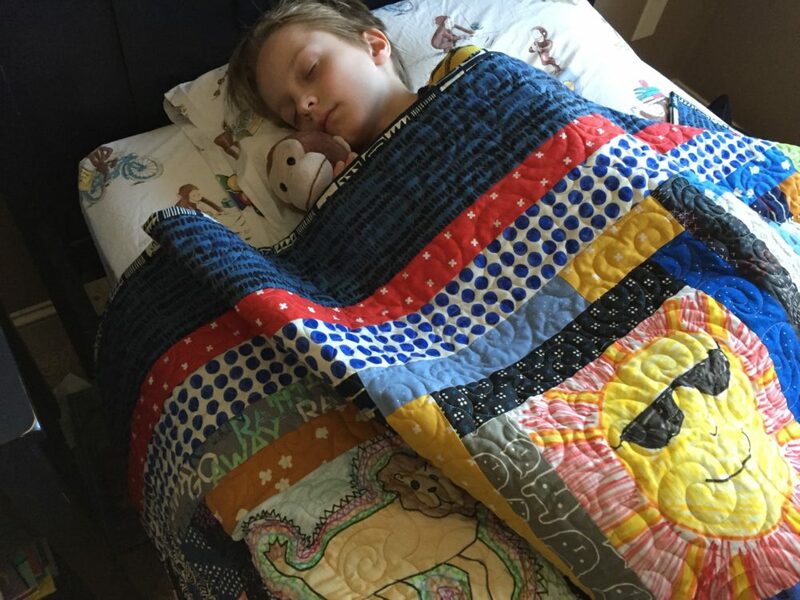 I bordered each of their artwork blocks with two rows of strips and then puts the quilts together….3 rows of 3 blocks each. I then bordered as needed to make them fit their beds. I used a number of border strips of varying sizes. On Taylor’s, I even used a different fabric for each side of the quilt for the outside border. These are great scrap quilts. I suggest you check out all the archives for a lot of fun ideas i posted over the last year and half. What a lovely idea. I am going to share this with a friend who has granddaughters. I enjoy your newsletters. Thank you. And happy Valentines Day. Never fear, she will always think this is special. I can remember everything my Grandmother did for me when she was alive and I cherish every memory. Ella will too. You are indeed a wonderful Grandmother. The quilts are beautiful! I can see both children’s personalities in their individual blocks they made. What a lucky Ella. I think she takes after her grandma!